Easy one-hand activation with Smart-Start Mixing Shaft. Contoured splash shield reduces discomfort on the operator's wrist and easily removes for cleaning. Stainless steel pan removes easily for cleaning; no tools required. Includes 929 agitator for hard and soft mixing. Unit comes with base, spindle with agitator, splash shield, and removable stainless steel pan. Manual Mode: Allows the operator to control mixing time and motor speed (variable speed control). Pre-programmed Cycles: Offer consistent mixing results regardless of operator. Smart Start: A simple press of the mixing shaft starts the motor. Contoured Splash Shield: Reduces discomfort on the operator's wrist and easily removes for cleaning. 929 Agitator: Maximizes mixing performance for hard- and soft-serve ice cream and is especially good for candy mix-ins. Specifications: Controls: On/off rocker switch; rotary dial with variable speed selections. Motors: 1/3 Hp. 120V, 60 Hz, 6.4A. 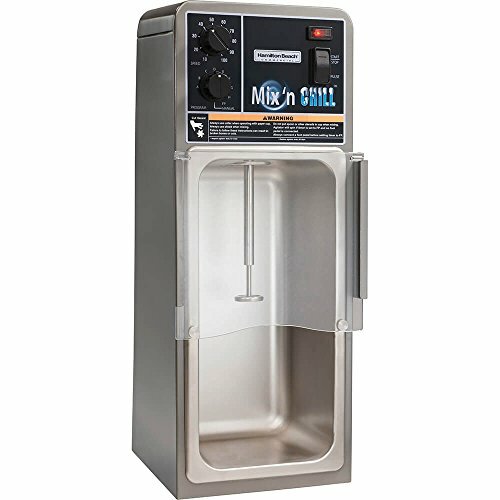 929 Agitator: Maximizes mixing performance for hard- and soft-serve ice cream and is especially good for candy mix-ins. Contoured Splash Shield: Reduces discomfort on the operator's wrist and easily removes for cleaning. Contoured splash shield reduces discomfort on the operator's wrist and easily removes for cleaning. Manual Mode: Allows the operator to control mixing time and motor speed (variable speed control). Unit comes with base, spindle with agitator, splash shield, and removable stainless steel pan.